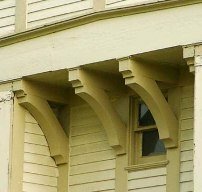 The Stick style is a unique American style of architecture using the abundant resources of wood found in the United States. Considered a masculine architecture of sharp lines, lots of angles and not limited by the difficulties of masonry construction, the Stick designs soared high into the sky with plenty of American imagination. The houses are topped by high roofs with steep slopes. The design is asymmetrical and the interior space usually opens out onto one if not several verandas. 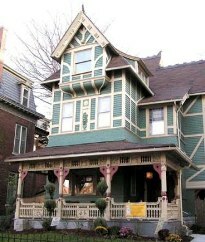 Evolving out of the Carpenter Gothic, the Stick Style flourished in the mid- and late-19th century. 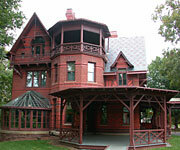 It reached its height of popularity in Newport, Rhode Island, in the 1870s. 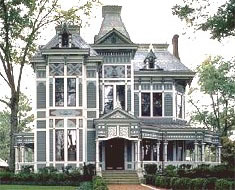 Richard Morris Hunt is probably the most notable of many American architects influenced by a mid-19th-century European revival of rustic country architecture. Particularly the gingerbread-ornamented chalets of the Alps, the half-timbered cottages of Normandy, and Tudor England. 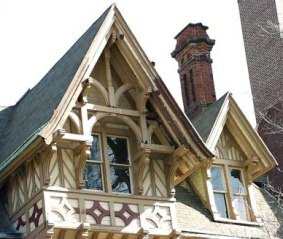 The styles main characteristic is a decorative detailing called "stick work." Imitating Medieval half-timbered houses and their exposed structural members, this stick work is applied decoration. Vertical, horizontal, diagonal, and crisscross boards are applied over the façade, creating interesting patterns that resemble half-timbering with no structural relation to the underlying construction. 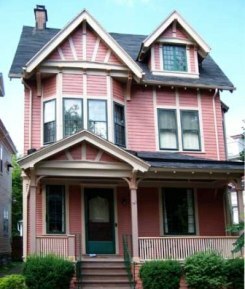 •	decorative vertical, horizontal, diagonal and crisscross boards resembling half-timbering with horizontal clapboards applied between them.